Volkswagen AG has announced that the company would be debuting a night vision system on its 2019 Touareg crossover vehicle. The technology would involve the use of an infrared camera in order to detect the thermal image emitted by objects like large animals, pedestrians and cyclists who are as far as 425 ft away. This distance is beyond most high-beam headlights. In the event that the object lies in the vehicle’s path, drivers are alerted through visual and/or audio cues. Initially, the objects that are detected on the side of the road are represented in yellow within a black and white image which is seen on the vehicle’s digital instrument panel. The yellow figure becomes red as the vehicle moves closer and the object crosses thresholds boundaries in line with the vehicle’s path. Drivers can opt to turn the full display on and off but Volkswagen has said that the system is automatically activated in the event that a potentially dangerous situation is detected with the vehicle moving at speeds that exceed 50 kph (31 mph). When the vehicle is moving at a slower speed, potential risks are indicated by an audio warning and a head-up display in vehicles which have such systems. The night vision system is linked to an automatic emergency braking system and if it senses a collision is imminent will prepare the brakes to provide immediate maximum deceleration. 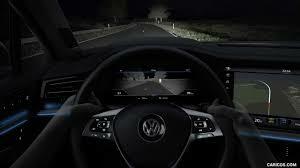 The system also can be teamed with VW’s “IQ.Light” LED matrix headlights that can spotlight detected objects.